Our proposal integrates the hostel with existing geological formations and transportation routes in an effort to minimize the ecological and archeological impact of proposal. The compact design deals with circulation and habitation in a stratified manner, allowing guests and visitor to ascend directly to the archaeological city, or meander vertically through the museum and botanical gardens. 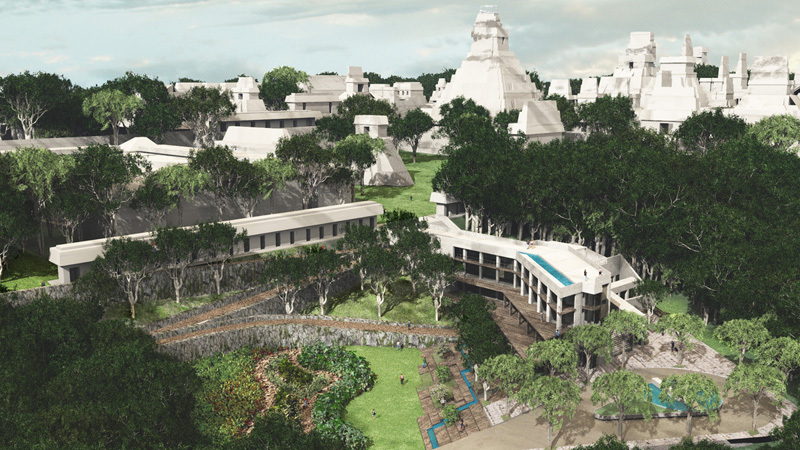 This stratified approach allows visitors to experience the rain forest both horizontally and vertically by providing a gradient of gardens that blend into the existing forest. As guest move vertically through the site they also experience the geological formation that acts as a podium to the ancient city. This stratified experience of canopy and geology culminates at the base elevation of the current archaeological site and allows visitors to enjoy the historic site with an unimpeded view of our modern intervention.